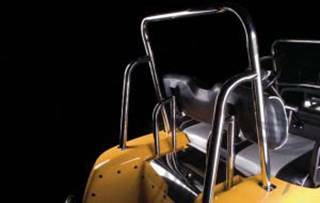 Complete the look of your golf cart with an ornamental roll bar to match the sport windshield. --Made from high quality stainless steel or black powder coated carbon steel. --Tubing is 1.25" in diameter. --The supporting feet are mounted side to side. --The roll bar is ornamental and is not designed to add protection if the golf cart is turned over. 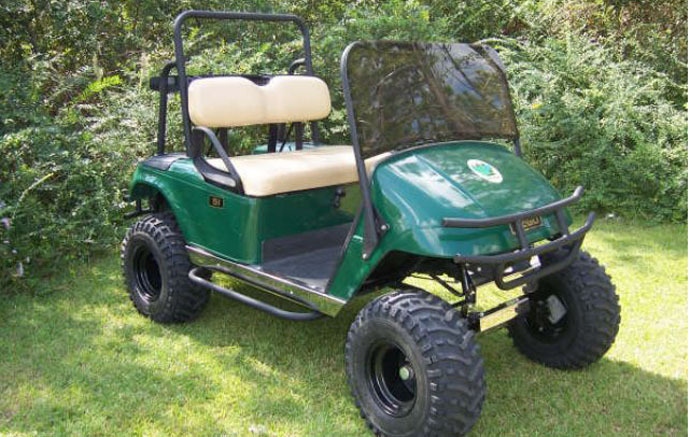 --Available to Cub Car, E-Z-GO and Yamaha golf carts. To the right is a lifted E-Z-GO golf cart with the ornamental roll bar and matching sport windshield, nerf bars and brush guard. Below is a close up on the roll bar. A universal roll bar that fits on all makes of golf carts. 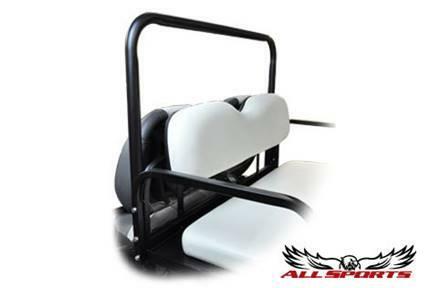 --A universal roll bar designed to work with golf carts that have a rear seat kit or cargo box on the back. --The bar is ornamental and not design to be used as protection. --Diameter of the tube is 1.25". --Includes all hardware: mounting pads, washers, nuts and bolts. --Comes in black or stainless steel. If you have a hard top presently on the cart, it can be replaced with a convertible top. Customers who purchased this roll bar were also interested in a sports windshield, lift kits, and nerf bars.